There's many parts to the perfectly decorated dorm Christmas Tree. You need mini dorm lights for some fun style. You also need Christmas bulbs of your favorite movies, colors, or even mementos from home. What's missing? You don't want to do dorm room decorating in your college dorm room without garland! Garland has the unique ability to tie all of your holiday decorations on your dorm Christmas tree together for a unified look. Since garland has so much power for your dorm essentials in your holiday decorations, you really don't want to go without it. Then you have the hard part of deciding which garland to go with. There's so many choices out there, what do you choose! 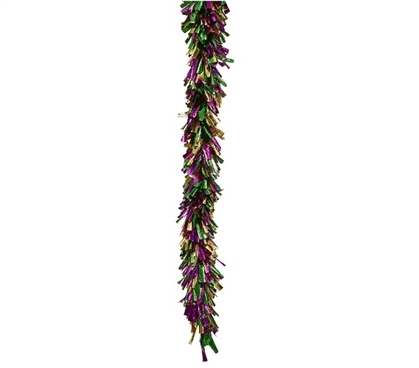 Our Mardi Gras Foil Garland is a fun, festive addition to holiday dorm room decor. Featuring purple, green, and gold strands in this holiday dorm room decorations item, your college dorm room Christmas tree will really stand out from the others on your residence hall floor. And when you dismantle your dorm Christmas tree, you don't have to put the garland away completely! Bring it out again for Mardi Gras time and place it on your dorm room door or dorm desk!